NHL News : Blackhawks sign Delia to an extremely team friendly deal. Blackhawks sign Delia to an extremely team friendly deal. The Chicago Blackhawks have just completed what may look like a relatively minor signing, but a signing that is anything but minor. Fans in Chicago will already be very familiar with backup goaltender Collin Delia by now as he has been called upon several times already this season to step into the crease and backstop the Blackhawks. The undrafted 24 year old goaltender has made 12 appearances for Chicago this season and has been nothign short of excellent while making those starts, 12 of his first 14 career games in the NHL. 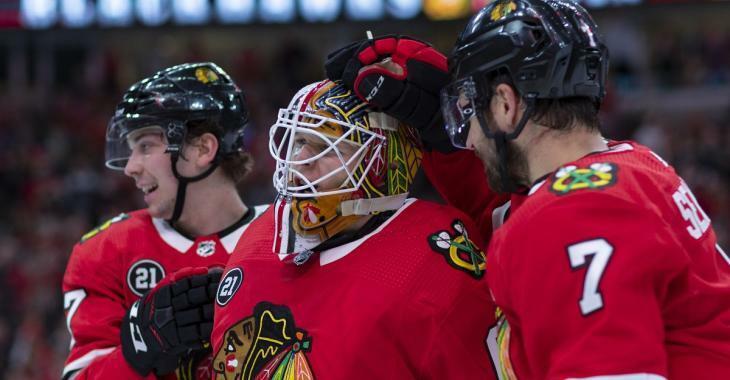 Through his 12 games as a Blackhawk during the 2018 - 2019 NHL regular season Delia has posted a 2.98 goals against average and a very solid .923 save percentage, resulting in 6 regulation wins for the Blackhawks over those 12 games and collecting a total of 15 points in the process as well. As you would expect this has made Delia a very valuable commodity, especially given the concerns that there are now in the Blackhawks organization regarding the long term health and well being of star goaltender Corey Crawford. There are many who believe that the still relatively young Delia could very well end up being Chicago's goaltender of the future at some point so with all of that in mind today's announcement by the Blackhawks organization feels like a steal. According to the Blackhawks they have locked in Delia to a brand new 3 year contract that will carry an average annual value of just $1 million per season, a very team friendly cap hit. Now for Delia himself a guaranteed $3 million dollars over a 3 year deal likely has to feel like life changing money, and it probably is to be fair, but for the Blackhawks this has to feel like an extremely team friendly deal, especially if they lean more and more on Delia moving forward. There is one more interesting wrinkle to this contract however and that focuses on the term of this deal. The 3 years is no arbitrary number pulled out of the air by general manager Stan Bowman, but rather it's a length of term that will carry Delia through what is expected to be the expansion draft for the as of yet to be named team that will be created when Seattle joins the ranks of the NHL. That would give the Blackhawks an option in net to expose to the expansion draft, making this an even sweeter deal for the Blackhawks.